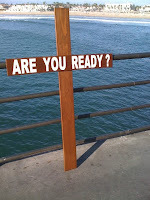 On Thursday I stopped off at the Huntington Beach Pier on my way home from work, paid for an hour of parking, assembled my "Are You Ready" cross, and began walking toward the pier. Since building the cross, I have displayed it at several busy intersections and have set it up at the San Juan Capistrano train station where I preach on Sundays, but this would mark the first time the cross has been used while tracting/witnessing. I had no idea how people would react to me passing out tracts and sharing the gospel with them while holding a wooden cross. Needless to say, I was nervous! However, it turns out that my nervousness was unfounded. The "Are You Ready" cross serves as a wonderful ice breaker! People would see me coming, would begin talking among themselves, and by the time I walked up to them they seemed to expect me to share the gospel with them! I was able to have 8 one-to-one conversations during my 1 1/2 hrs. on the pier (remember, I had only paid for 1 hr parking - no ticket though, praise the Lord!). Also, while walking down the pier, I noticed that people below on the beach would see the cross and comment among themselves. I even heard a couple of surfers in the water talking about the cross after seeing it! There is one encounter that I would like to share. God used the visual of the cross to stir up a fellow Christian surfer who was walking toward the water. He saw the cross and shouted up to me asking what it was for? I asked him if he was ready for eternity. He told me that he was a born again Christian and then went on his way praising God! As I continued further down the pier, I walked up to a man sitting on a bench and offered him a gospel tract. He looked up at me and said, "another sign". "Another sign? ", I asked. He then explained to me that he had lost his job that very day and while he was sitting there just moments before, a surfer came by on the beach below and hollered up to him and told him that he should cheer up because this was a beautiful day God had made. God used the visual of the cross to stir up the surfer who then passed along a small encouragement to this man on the bench and then God allowed me to continue that work by being able to share the gospel with this man! God is AMAZING! The man claimed to be an atheist but I was able to reason with him and challenge his world view. He promised me he would read the tract and consider that we talked about. Please pray for him - his name was Mark. Wonderful story, Jeff. I love how the Lord works in all the different ways we read about, including this one. The cross has already proven to be a valuable tool in the realm of street evangelism. God is so good!